Note: This is the homily I will give to the Filipino community here in Brunei. 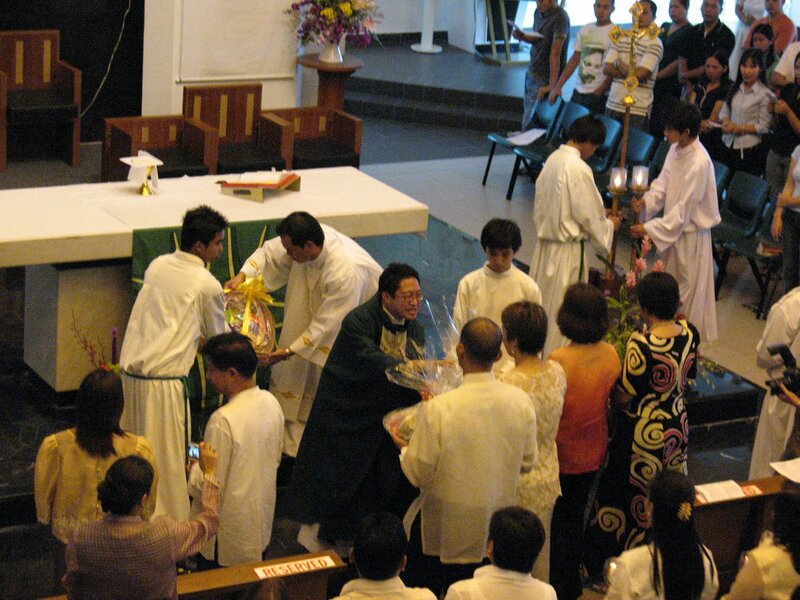 They will celebrate Independence Day at the Parish of Our Lady of the Assumption, Banda Seri Begawan, Brunei Darrusalam. Filipino epics, legends and teleseryes (soap opera) have it that heroes are made after being pushed against the wall by obstacles, tragedies and villains. It begins with the reluctant hero being bullied and trampled under foot and ends with the hero mustering all his strength — wielding his amulet — and destroying his enemy. The strength of the hero is tested when it can survive the elements. The story of our independence runs on the same storyline except on the part when the hero wields his sword and amulet. We are still on the inaapi than on the heroic. When General Emilio Aguinaldo declared Independence on June 12, 1898, the country had too much of abuses from the administration of Spain. When our independence was finally given by the United States on 4 June 1946, after being self-governing in 1934 (Tydings-McDuffy Act or the Philippine Independence Act), we faced political instability, unmitigated corruption and dictatorship, national debt, coup attempts, and a great financial crunch. If this is the stuff of legends, then this is the part when the would-be hero should slowly muster all courage and strength and take out his amulet to vanquish the enemy. Our amulet is the value system that carries our strengths as a people and as a country. This is the time to be heroes. This is not the time to focus on our weaknesses, but the time to focus on what we have best. What do we have? There are many things to be said. But let me highlight some. First, the Filipino is known for its unique hospitality. We are not the only people who are friendly, warm and welcoming, but our brand of making a guest “at home” is said to be different. The family offers something to eat, will not complain about being disturbed, and will offer the best to the stranger or foreigner. The same way when we establish relations with other countries: in Brunei for example, our brand of hospitality is seen in our ability to care for strangers as if they are of our own family, living in our very own homes. Our ambassador and consul come to our gatherings and parties, wherever we are. That is personal care. The Filipino is someone whom others entrust to look after those who are dear to them, their child, their elderly and their home. That is strength. Second, the Filipino has a strong sense of gratitude, loyalty and friendship especially to people who helped them in any way. We treasure our friendships in any circumstance; and our bonds are strengthened by the stories of our lives. How many times have we come to help a friend in need? Our friendship with other people are genuinely treasured and even celebrated with good food and music! Think of thoughtfulness when one celebrates birthdays and anniversaries. You get to receive a card, an email, a text message, a call or in very special circumstance, a surprise party! Third, the Filipino is a like a bamboo who is flexible, enduring and harmonious. We bend with the wind, but survive a storm. We cope with destiny and do not fight against it. We are pliant and open to new ideas, but can stand up for our own beliefs. So, what then should we do? I get some ideas from Mr. Alex Lacson. First, we share our stories. Teach your children and your friends from abroad about the Philippines. Let your children love our country and its people. Tell them about the province you came from. Let them taste the food from your home. Tell them how your mother and your grandmother cooked bicol express and laing if you’re from Bicol, kinilaw if you’re from the Visayas, empanada and papaitan if you’re from the Ilocos. If you can’t show them your origin, let them taste it. Let your spouse, if he’s not Filipino, hear what you love about the Philippines, eventually, they too will love and admire it. Sure, there are many things that dishearten us about our country — like all other countries — but there are many things to be proud of. In 2004, we heard of the story of Nestor Sulpico, a Filipino taxi driver in New York. He drove 43 miles to Connecticut, USA to return US $80,000 worth of rare black pearls to his passenger. We are a race capable of greatness! Second, we patronize our own. TIME magazine said that the crucial factor for a country to prosper is not foreign investments, but national patriotism. It is when Filipinos buy Filipino products and appreciate Philippine-made items. It is when Philippine products disappear from the stalls faster than Giordano shirts! Third, maybe we can sponsor a poor child back home. We are around 86 million people. The Catholic Bishops Conference of the Philippines (CBCP) said that 53% of our population are poor, having no access to education. Most of them are children. Our lives, therefore, are challenged to renew the spirit of the Filipino. Fr. Horacio de la Costa SJ said that we may be poor but we possess two precious gems: our faith and our music. As we celebrate Independence Day, we celebrate our being Filipino. “Love one’s neighbors,” Jesus said. Our faith should help us transform society wherever we are. “Love God with your entire mind, with all your heart, with all your soul,” Jesus said. Our music should sing of the glory of God shown in the beauty of a people called, the Philippines. Indeed, this is the time to muster all our strengths. This is the time to bring out our amulets. This is the time to be heroes. This is the time be legends.